'Astonishing' statement by senior officer reveals police have permission 'from way up' to ignore the courts, veteran campaigner says. The Israeli courts may have once again ruled in favor of Jewish prayer on the Temple Mount, but a senior Jerusalem police officer made it clear to Jews visiting the holy site that the police would not be following that ruling. The officer, who is well known to Jewish visitors and responsible for clearing Jewish visits (amid severe restrictions), told a group Wednesday morning that as far as he and the police force as a whole were concerned "this court ruling doesn't exist." Rabbi Chaim Richman, International Director of the Temple Institute and long-time advocate for Jewish rights on the Temple Mount, recounted the "astonishing" conversation to Arutz Sheva after returning from his visit. 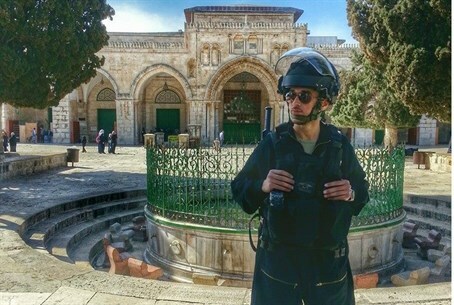 The fact that a police officer was willing to so brazenly deny the court's authority "reveals the depths of the subterfuge" involved in banning Jews from worshipping at their holiest site, he said. Rabbi Richman was part of the first group of Jews to ascend the Mount Wednesday morning, and recounted the sense of excitement felt by many younger Temple Mount activists in light of the ruling. "Some people were talking among themselves about the court ruling, saying let's wave it infront of the police so they let us pray." Rabbi Richman, however, was far more cautious in his optimism about the ruling. Echoing sentiments he made in a previous Arutz Sheva interview, he noted that the ruling earlier this week "wasn't really a precedent," since "literally tens" of similar rulings have been made by the courts over the past 30 years or so - and each time the police overrule it, citing unspecified "security concerns." "But I never expected something so outrageous," he said of the exchange. "We got up on the Mount and it was the same deal as always," with the Jewish group being ordered not to pray or conduct any forms of "illegal" (read: non-Muslim) worship, and limited in their numbers. "And then, when the officer in question overheard people talking about the ruling he said something astonishing. In these precise words, he said: 'This court ruling doesn't exist. Nothing has changed.'" If anything, police were more zealous than ever in preventing Jewish prayer, Rabbi Richman claimed, in an attempt to make the officer's sentiment abundantly clear. One "veteran" member of the group, a man in his late 50s - "someone the police know as a law-abiding guy, not a troublemaker" - was scolded by police for having his head down at one point. "They told him 'If I see you move your lips again I will throw you off!'" Later, as the same man was shivering from the cold, and the same policeman confronted him again for moving his lips, warning him "not to do anything that even looks like you're praying." For Rabbi Richman, the whole experience was not so much lesson in the Jerusalem Police Department's disregard for the courts, but something far more fundamental. "It was so utterly outrageous and completely over the top for him to say those words (that the court ruling 'doesn't exist'), it's clear that this is not simply a case of the police ignoring the judicial system. Clearly they know they're protected - this is coming from way, way above." "Over the past few years, developing relationships with the officers involved with coordinating our visits, I learned a lot... I began to understand there is something much deeper going on here than the police or the courts. It has to do with Israel's relationship with Jordan," he explained. Under the terms of Israel's peace treaty with Jordan, the Jordanian Waqf Islamic authority has full control over the Temple Mount, and non-Muslims are banned from worshipping there - despite it being the holiest site in Judaism. Jerusalem's concern over regional threats such as the spread of both Islamic State and Iran, among other things, has helped position Amman as a key ally - one Prime Minister Netanyahu is not about to alienate over the Temple Mount. The prime minister and government are "above the law" in this case, rendering the court rulings more symbolic than binding. But Rabbi Richman remains optimistic as always. The way forward, he says, is "the same way that got us this far - further than ever before: by bringing more and more Jews and getting more and more rabbis involved." And those efforts are paying off. "The sheer numbers of Jews waiting to visit the Temple Mount this morning were a beautiful site, even if the police restricted the visits to 10 per group - which is their latest 'trick' - and later restricted it even further, to just five." The more Jews show their interest in the Temple Mount, the more rabbis currently sitting on the fence for political reasons will be forced to accept the legitimacy of the movement to reclaim the Mount, he emphasized. "I want to tell this story not to depress people, but to let them know what is happening," he said. "Am Yisrael are demanding a change - it's just a change that will have to come from the bottom up."